Cross another one off the “bucket list” for me! 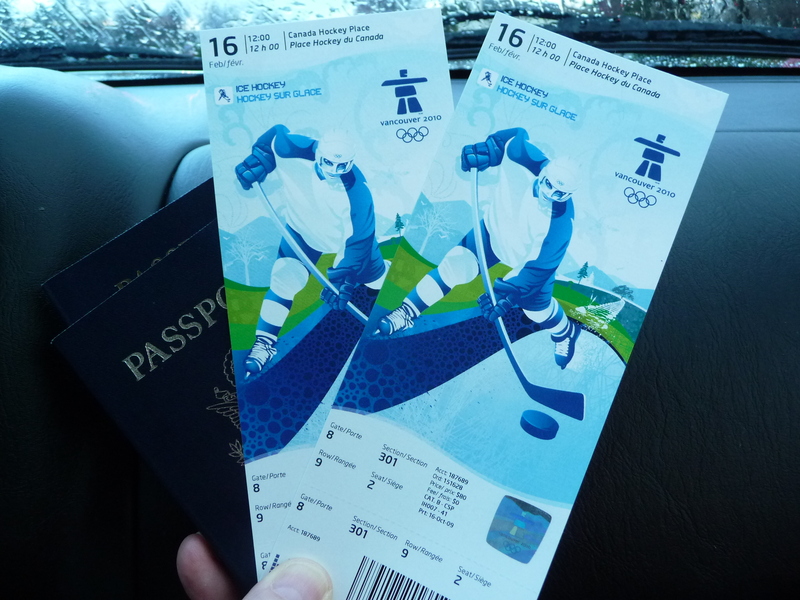 I’d always dreamed of one day attending an Olympic event and last week I was lucky enough to have attended two. We purchased our tickets last May and while the wait was long, it was sooo well worth it! 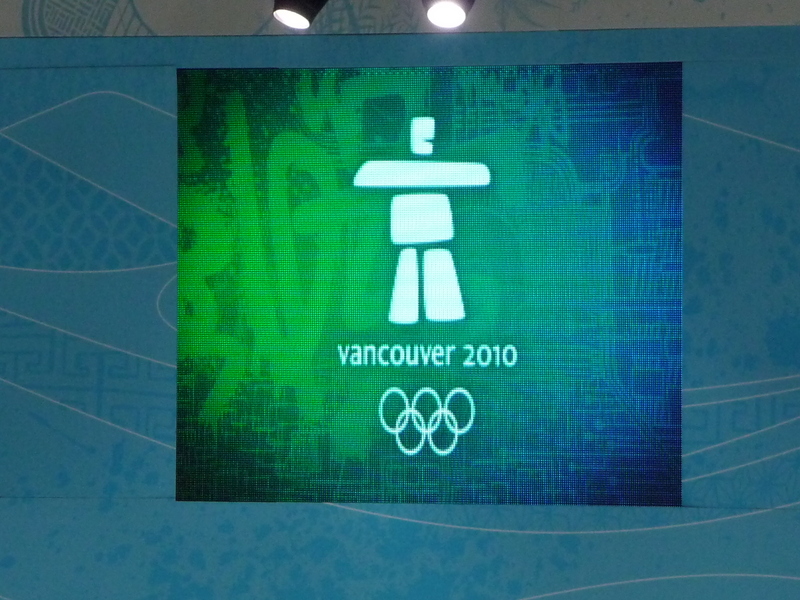 I just knew it was “now or never” to fulfill this life-long dream, with the 2010 Winter Olympics being held less than 100 miles from our home. 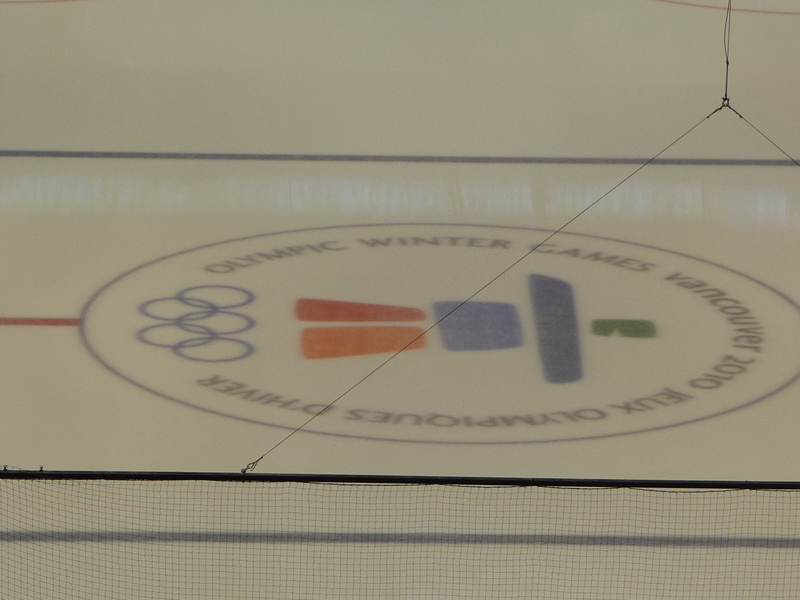 So with tickets and mass-transit plans in hand, off we went early Tuesday morning to Canada Hockey Place in downtown Vancouver. We found one of the last parking spots in Surrey at the Sky Train station and hopped aboard. We noticed that nobody checks your Sky Train tickets. Nobody. Maybe it’s a free-for-all these two weeks of the Olympics? At any rate, the Sky Train worked great, was on time (the ride into Vancouver proper was about 40 minutes), was clean and safe. Oh, and VERY well traveled too. LOTS of folks (not just Olympic spectators) use this excellent form of mass transit. Upon arriving at Canada Hockey Place, it was a bit of a walk to actually go through the security tents and IN to the stadium. Now most folks would not complain about the hike, and I’m not complaining, but I really did feel for my dear hubby whose VERY bad hip makes walking pretty tough these days. Upon entering the stadium, we were met with the smells of your typical sports arena foods and many stands selling official Olympic “stuff”. We did get a t-shirt for DH and later on I got a my choice of a souvenir too 🙂 Picture to follow on that one! After MANY more stairs we made it to our seats – which were great for hockey viewing! We were in the “end zone” and thus, had a different perspective of the game than you would get on TV. 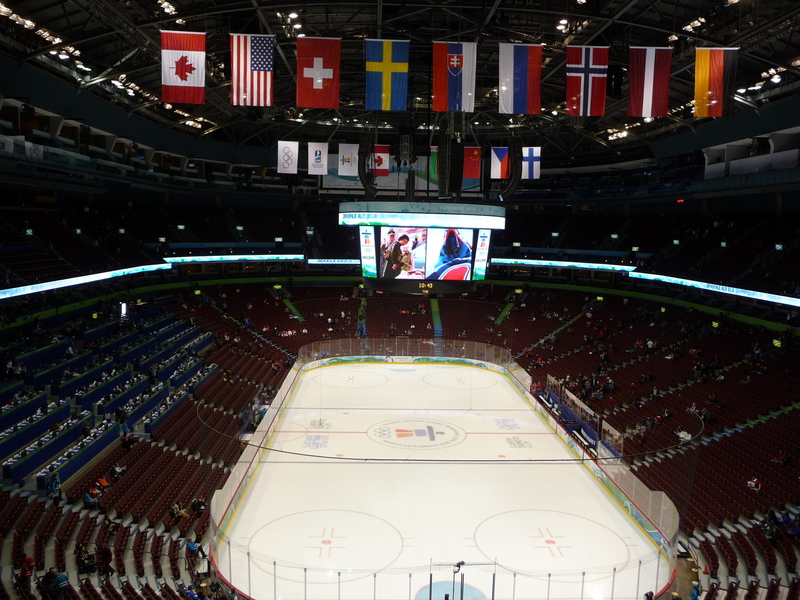 They had transformed GM Place, home of the Vancouver Canucks into a great Olympic venue. 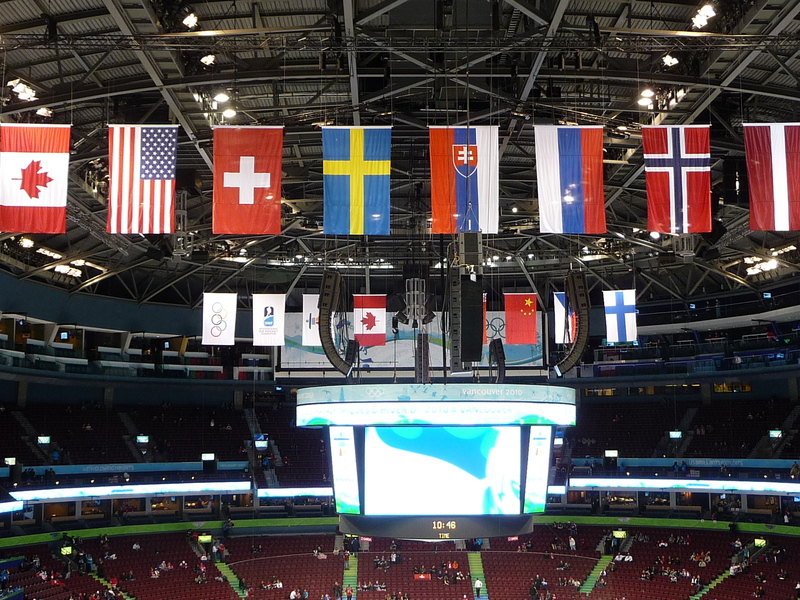 I loved all the nations flags hanging from the rafters… and the 2010 Olympic logo – the Inukshuk – shining up from center ice. Reality set in: I was truly at THE OLYMPICS! Please click on any/all of above photos for a bigger view. 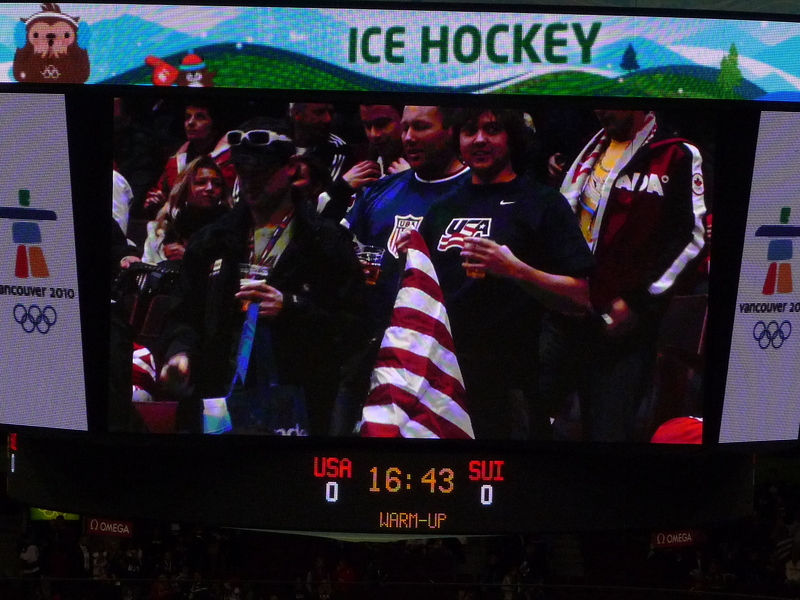 There were hoards of Canadian fans there (of course) but also MANY from the USA and even a few that were waving Swiss flags. The shouts of U S A U S A were intermingled with the ringing of cowbells and shouts that sounded like “haute suisse” by the die hard Swiss fans. Have I ever really cheered for my country before? I mean IN PERSON? What a thrill it was for this life-long sports fan 🙂 Our USA team did not disappoint, coming out on top 3 goals to 1. 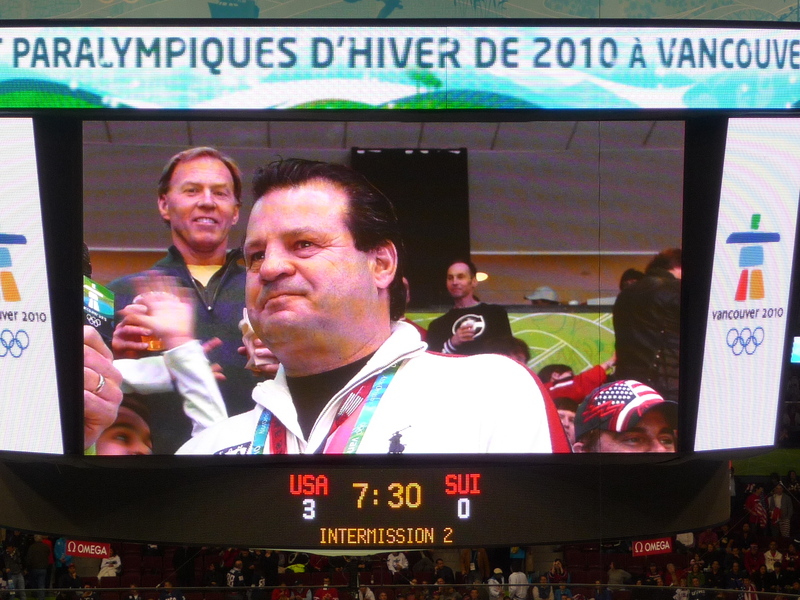 Another great moment happened during one of the breaks when they interviewed Mike Eruzione, captain of the 1980 “Miracle on Ice” Olympic gold medal team – he got a “standing O” from the crowd! Here is Mike on the Jumbotron: I’m not holding my breath, thinking we’ll have another “Miracle on Ice” year this year – guess I’m just too realistic. And yet…. wouldn’t that be great?!!!! After the game DH, myself, and our friends Howard and Kristy walked over to Chinatown for an early dinner. The food as well as the company was great! Yes, there was a lot of walking and a LOT of stairs… but DH made it – as I knew he would! Before nightfall, we were back on the Sky Train headed towards the park and ride, and home by about 7pm. It would have been so much fun to have wandered down to Robson Square to get in on some of the excitement, but it’s okay that we missed that. We got to see a great hockey game! 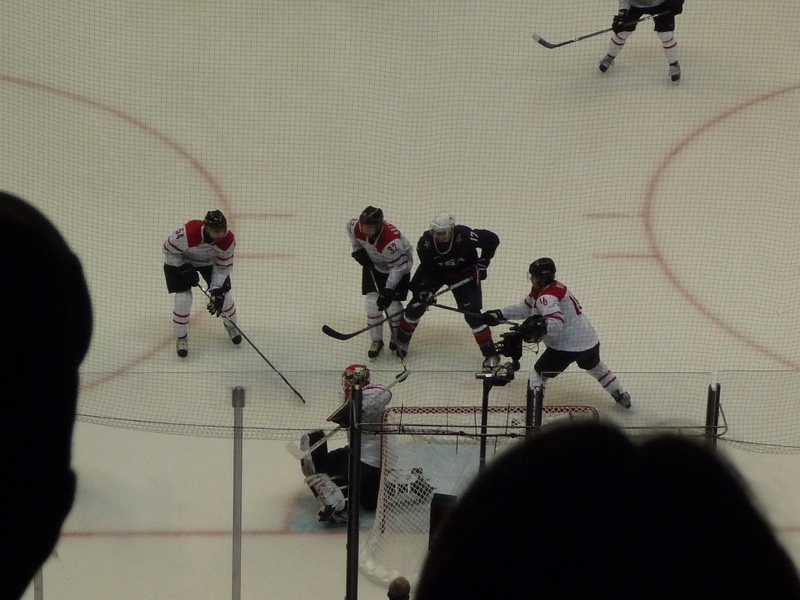 An Olympic hockey game! And we won!! Woot woot!! Coming next: Day Two – Short track speed skating and our Washington state “hero”, Apolo Anton Ohno with his young sidekick (also from our state), 19 year-old J.R. Celski. 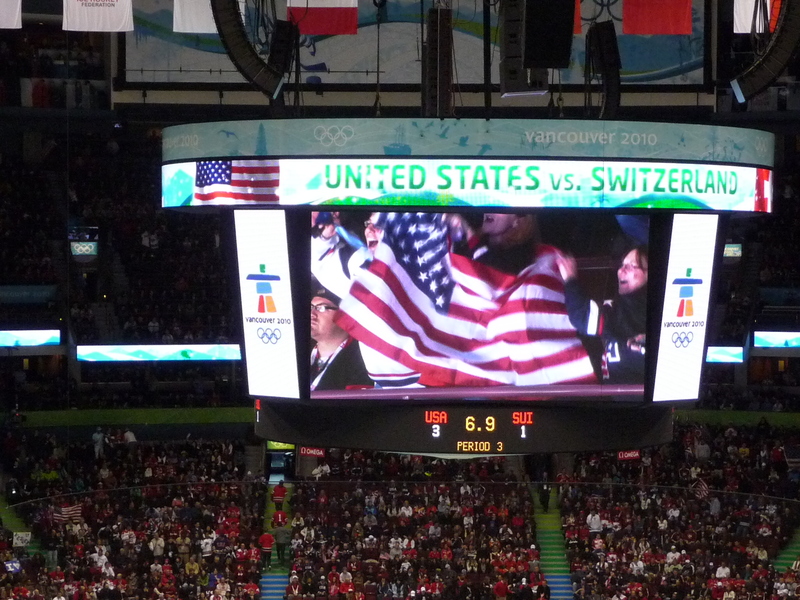 This entry was posted in General Musings and tagged Mike Eruzione, Olympic Ice hockey, USA vs Switzerland hockey, Vancouver 2010 Olympics. Bookmark the permalink. Dear Susan ……….thanks for sharing your great experience and well done John for walking all that way…..LOVE GLENDA….Look forward to the next Olympic installment.